The post from C Technology, better known by Weibo handle "iCTech," lists five features claimed to be in the works for this year's iPhone update including a three-lens camera system with 3x telephoto lens, 4,000mAh battery, 15W wireless charging, reduced TrueDepth camera notch and a 90 to 120Hz screen refresh rate. As usual, iCTech does not ascribe the information to a specific source. The account has a spotty reputation and has in the past provided both accurate leaks — photos of Apple's iPhone 5c Quick Start guide — and rumors that ultimately proved incorrect. AppleInsider is unable to confirm the veracity of iCTech's current claims and presents the information for purposes of discussion. 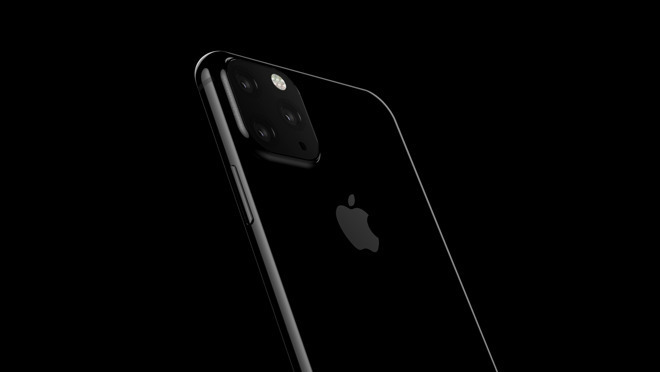 Rumors of Apple's interest in incorporating a third rear-facing camera into iPhone first surfaced in early January when supposed renders of an engineering validation testing (EVT) design were shared on Twitter by known leaker Steve Hemmerstoffer. Another render from the same source was shared this week. Hemmerstoffer was unable to provide specifics of the triple lens phone beyond its alleged design. With the current iPhone XS and XS Max featuring wide-angle and 2x telephoto lenses, a jump in magnification is feasible. On the battery claims, the latest iPhone XS and XS Max are powered by 2,658mAh and 3,174mAh batteries, respectively, while the iPhone XR incorporates a 2,942mAh cell. Bumping capacity to 4,000mAh would already be a technical achievement with the existing form factor, let alone squeezing what would presumably be a larger cell into a similarly sized chassis that boasts an addition camera module. Previous reports claim Apple is already grappling with space limitations as it attempts to position the triple-lens rear camera array, with rumors suggesting engineers are thinking about changing the shape of the battery. Along with a larger battery cell, the Weibo post claims a next-generation iPhone will feature 15W fast wireless charging. Unlike the bespoke solution developed for Apple Watch, Apple adopted the Qi standard for iPhone, which supports 15W throughput. An iPhone supporting high capacity wireless charging could be in the cards for 2019, but thermals could be an issue. Echoing recent rumors, iCTech also claims the next iPhone will feature a smaller TrueDepth notch than current models. Rumors this week point to a revamped TrueDepth array with 10-megapixel camera, up from the current 7MP found in iPhone XS and XR. Finally, the Weibo post notes support for a 90 to 120Hz display, the latter being identical to refresh rates seen on iPad Pro. Faster refresh rates equate to smoother animations and more accurate user input at the cost of battery life. Apple addressed the issue in part with ProMotion, a variable display rate technology that automatically adjusts refresh rates between 24Hz and 120Hz for an optimal blend of performance and efficiency. Apple is expected to release three new iPhone models this fall, two of which are anticipated upgrades to the current OLED-toting XS line. A third model should revamp the low-cost iPhone XR. Update: The Weibo entry appears to be a regurgitation of a 2019 iPhone wish list shared on Twitter by noted leaker Ben Geskin.